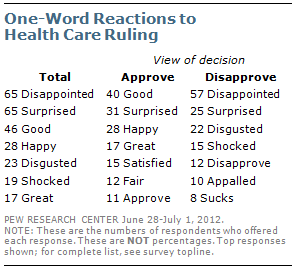 The public has long been divided in its opinions about the 2010 health care law. There is now a similar division of opinion over last week’s Supreme Court decision to uphold the law – 40% say they disapprove of the decision, while 36% approve and nearly a quarter (24%) offer no opinion. Despite extensive public interest in the court’s ruling, just 55% of the public knows that the Supreme Court upheld most of the health care law’s provisions; 45% say either that the court rejected most provisions (15%) or do not know what the court did (30%). Among those aware that the court upheld most of the law, 50% approve of the decision while 42% disapprove. The persistent partisan divisions over the law are reflected in the public’s reactions to the court’s June 28 decision. 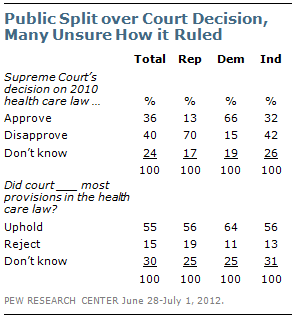 Seven-in-ten Republicans disapprove of the Court’s decision, while 66% of Democrats approve of it. About four-in- ten (42%) independents disapprove of the ruling while 32% approve. The latest national survey by the Pew Research Center for the People & the Press, conducted June 28 to July 1 among 1,006 adults, finds that the top single-word reactions to the court’s decision are “disappointed” and “surprised.” While “disappointed” is by far the top reaction among those who disapprove of the decision, “good,” “surprised” and “happy” are the top words among those who approve of the ruling. The survey finds that 45% followed news about the court’s decision very closely, making it the second most closely followed story of 2012 (52% tracked news about rising gas prices in March). Among those who tracked news about the health care decision very closely, 50% approve of the decision while 45% disapprove. Among those who followed this news less closely, just 24% approve, 37% disapprove, with 39% offering no opinion. There are substantial age differences in news interest in the decision, as well as in awareness of what the court decided. 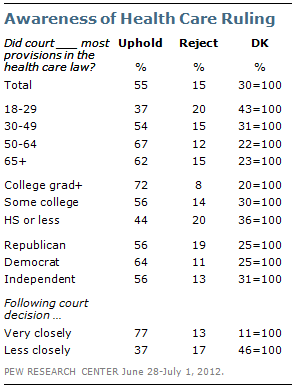 Only about quarter of those younger than 30 (24%) followed news about the court’s health care decision very closely. That compares with 42% of those 30 to 49 and majorities of those 50 to 64 (56%) and 65 and older (62%). Just 37% of those younger than 30 know that the court upheld most of the law’s provisions; majorities of older age groups know that the court upheld most provisions. Majorities of those who have attended college answered this correctly, compared with 44% of those with a high school education or less. The Supreme Court’s health care decision is the month’s most closely followed story, surpassing the economy and the presidential election. (Public interest in stories earlier in June can be found here and here). This week, there also was more interest in the court’s ruling on health care than in its decision on Arizona’s immigration law (29% very closely) and the House vote holding Attorney General Eric Holder in contempt for not sharing documents related to a gun-trafficking investigation (22% very closely). Interest in the presidential election has remained fairly stable over the past few weeks. From June 28-July 1, 32% tracked news about the election very closely.